In science, a closed system is a system that doesn’t allow matter from outside environments to enter its space. It does not have interactions with other systems – though it may be influenced by outside energy depending on its environment. A closed system falls in between an open system and an isolated system in terms of outside influence. Although it is controlled in terms of matter that may pass in and outside of its boundaries, it is not protected from influence from temperature and similar types of energy. How is a Closed System Different from Open and Isolated Systems? There are many different types of systems that work in tandem with one another. These systems all have different defining characteristics that help to determine how they operate and which settings they are most useful in. There are three main types of systems – open systems, closed systems, and isolated systems. Open systems are systems in which there are no boundaries to prevent the system from being affected by outside matter or energy. This means that there is nothing to prevent the system from losing or gaining additional matter or energy and they freely exchange both of these things with the variables in their surroundings. An example of an open system can be seen above with the coffee mug. The mug is an open system because it has nothing to prevent the loss or gain of matter, as seen with the open top. An example of the loss of matter could be an accidental spill or (if the conditions were right) evaporation of some of the liquid. Gain in matter could occur if someone were to pour more liquid into the mug, or if an insect were to inadvertently fly into the mug. By examining the coffee mug we can also see that the temperature of the system isn’t controlled. The steam in the mug is free to escape into the surrounding environment, therefore releasing energy. The mug is also susceptible to its surrounding environment in terms of absorbing energy. For example, if the coffee mug was sitting outside on a hot summer day, it would be susceptible to absorbing sunlight which would increase its temperature. A closed system is a system in which matter cannot escape or be added to an environment due to some type of boundary. Although a closed system is more controlled than an open system, however, it is still susceptible to outside heat and energy. This means that it can both absorb energy and have energy escape from its boundaries. An example of a closed system can be seen by looking at the water bottle above. Like the coffee mug, the water bottle is able to hold liquid inside its ‘system.’ Unlike the coffee mug, however, the water bottle has a lid to help ensure that the matter inside its system will remain constant. This is the major difference between a closed system and an open system. Although the closed system is more controlled than the open system, it isn’t able to account for energy that can be both lost and gained. 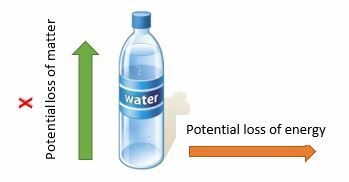 For instance, if a water bottle is left outside on a hot summer day, it will gain heat energy. Likewise, if a water bottle is left inside a refrigerator, the heat that was maintained inside the bottle will be lost. Lastly, an isolated system is a system that is completely closed off from outside interference. In these systems, there is no way for matter or energy to be gained or lost. Instead, everything is kept constant. An example of an isolated system can be seen by looking at the insulated thermos above. The isolated system is the most controlled of the three systems because it protects its contents from both the gain and loss of energy and matter. This means that the contents of the system are completely isolated from everything in the outside environment. 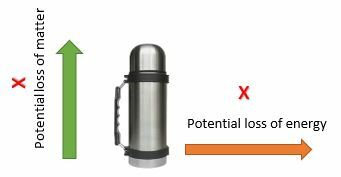 Whatever liquid may be inside is ensured not to spill thanks to the lid, and the insulated layer inside the thermos prevents the liquid contents from being affected by the outside environment. Likewise, the insulated layer also ensures that the energy inside the system doesn’t escape into the outside environment. There are many examples of closed systems, both in chemistry and in the natural world. It is common to see closed systems being used in experiments where temperature is not a factor. These systems help to make sure that an experiment is properly conducted and isn’t unintentionally influenced by an outside variable. Closed systems are a key part of experimentation in science, but they can be found in more than just man-made environments. There are hundreds of examples of closed systems that can be observed – including the entirety of the earth itself! Because the earth is protected from outside interference (space) by its atmosphere, it can easily be classified as a closed system. This is also an excellent example of how a closed system can still be influenced by outside energy like heat and UV rays. Although outside matter from space is mostly eliminated by the earth’s atmosphere, the planet is still largely influenced by the sun’s energy and heat. 1. There is a pot of boiling water on a stove. There is a lid that covers half the pot. What type of system is this? 2. An icebox full of ice is sitting outside with the lid on. What type of system is this? 3. A tupperware bowl full of spaghetti is sitting in a refrigerator with a lid. What type of system is this?